MATTHEW 24:5 KJV "For many shall come in my name, saying, I am Christ; and shall deceive many." 2And Jesus said unto them, See ye not all these things? verily I say unto you, There shall not be left here one stone upon another, that shall not be thrown down. 3And as he sat upon the mount of Olives, the disciples came unto him privately, saying, Tell us, when shall these things be? and what shall be the sign of thy coming, and of the end of the world? 4And Jesus answered and said unto them, Take heed that no man deceive you. 5For many shall come in my name, saying, I am Christ; and shall deceive many. 6And ye shall hear of wars and rumours of wars: see that ye be not troubled: for all these things must come to pass, but the end is not yet. 7For nation shall rise against nation, and kingdom against kingdom: and there shall be famines, and pestilences, and earthquakes, in divers places. 8All these are the beginning of sorrows. 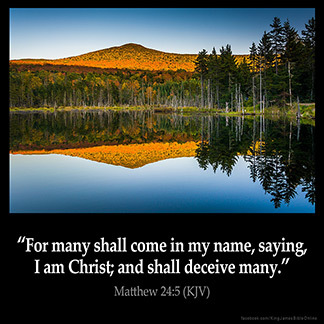 For many shall come in my name, saying, I am Christ: and shall deceiue many. For many shall come in my name, saying, I am the Christ; and shall lead many astray. For people will come in my name, saying, I am the Christ; and a number will be turned from the true way through them. For many will come in my name, saying, I am Christ; and will deceive many. for many will come assuming my name and saying `I am the Christ;' and they will mislead many. For many schulen come in my name, and schulen seie, Y am Crist; and thei schulen disseyue manye. 24:5 Many shall come in my name - First, false Christs, next, false prophets, #Mt 24:11|. At length, both together, #Mt 24:24|. And indeed never did so many impostors appear in the world as a few years before the destruction of Jerusalem; undoubtedly because that was the time wherein the Jews in general expected the Messiah. Mt 24:5 Come in my name. As the Messiah. We learn from Josephus that enthusiasts did come about the time of the end of Jerusalem, claiming to be sent of God. Bar-cocheba, "the son of the star", appeared in A.D. 120. From time to time other deceivers have appeared. The work "Christ" is defined as "The anointed one". Jesus said "Many will come in my name". This is the key to understanding this scripture. many focus on "I am Christ". When looking tat this scripture as many coming in the name of Jesus and the the word "Christ" as meaning the anointed one, then you will easily see it's meaning which is "Many will arise that will be preaching in the name of Jesus, and proclaiming that they are anointed, but be very careful of that because "many" will be deceitful and cause many believers to go after them and follow them. The root of this is the love of money. They proclaim that they are anointed and will actually produce a personal following. Many will be deceived simply because they have a desire to follow the one that is best anointed and seems to know the Lord and his ways, but wind up following one who is Christ within themselves. This is the reason "shepherding" became big in the 80's and the "anointing" became big in the 90's. They are not part of the five fold ministry because they are not doing what Ephesians said the 5 fold ministry should be doing. Be careful that you are not deceived. Be VERY carful. will claim that they are the incarnation of jesus.and they will cheat people. I believe that Jesus was saying that many will come and proclaim Jesus as the Christ, otherwise He would have said, "Many will come in my name claiming that they are the Christ". As we know there are no punctuation marks in the original Scriptures. It is in error to put I am the Christ in quotation marks.